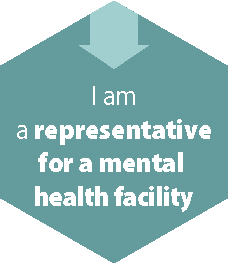 As a representative for a mental health facility, it is important that you understand your duties and responsibilities. You should also become familiar with the Rules, relevant legislation and other information that may help you better represent for your facility. A mental health facility generally means a provincial mental health facility in which a patient is involuntarily detained under the Mental Health Act or a mental health team if the patient is on leave under the Mental Health Act . Here is an updated list of designated facilities which admit and treat involuntary patients. A case presenter is a representative of a facility and a participant at a review panel hearing. The purpose of the hearing is to determine whether the criteria for certification still apply to the patient. A case presenter’s role at the hearing is to present the facility’s case for the patient’s continued detention under the Mental Health Act. A case presenter may give evidence at a hearing and should be knowledgeable of the patient’s history and condition, including relevant medical records. Case presentations are often conducted by a patient’s treating physician; however, the facility may assign another individual to be the case presenter, such as a case manager, nurse, mental health clinician or social worker. The facility may also assign co-presenters. The Board and review panels are governed by legislation, the key of which is the Mental Health Act and the Mental Health Regulation. Legal Test – The Review Panel will determine whether the four criteria set out in the Mental Health Act continue to describe the patient’s condition. All four criteria must be met to continue the patient’s certification. The purpose of the Rules of Practice and Procedure is to provide a fair, just, accessible and understandable process for everyone involved. Patients and facilities alike must comply with the Rules. You are strongly encouraged to familiarize yourself with the Rules. You may contact the Board if you require any clarification. Practice Directions – The Board has issued the following practice directions to help you better understand the Rules. You are strongly encouraged to familiarize yourself with these directions and contact the Board should if you require clarification. Practice Direction – Guidelines for Case Presenters – Includes a sample template for case presentation at the hearing. Practice Direction – Guidelines for Preparing a Case Note – Explains what, when and how. Practice Direction – Guidelines for Designated Facilities – Includes case note and case presenter, document disclosure, and communication with the Board. Practice Direction – Guidelines for Disclosure – Explains what, when, and how of disclosure by facilities and includes a sample template of request for disclosure. Practice Direction – Guidelines for Patient Representatives – Includes requirement to give notice if acting for a patient or no longer acting for a patient.